It’s your day, and deciding where to celebrate is a very personal choice. The Potters Heron, with its picturesque thatched roof, cosy corners and light, spacious rooms offers the perfect venue for your wedding. From intimate affair to guests everywhere, our experienced wedding planner can help you organise every tiny detail for what will be one of the most important days of your life. Our chef will help you design the perfect menu for your guests, our bar team can pair up all that lovely food with some of our fantastic drinks range and our events team will run it all for you with big smiles and feel proud to share in your special day. 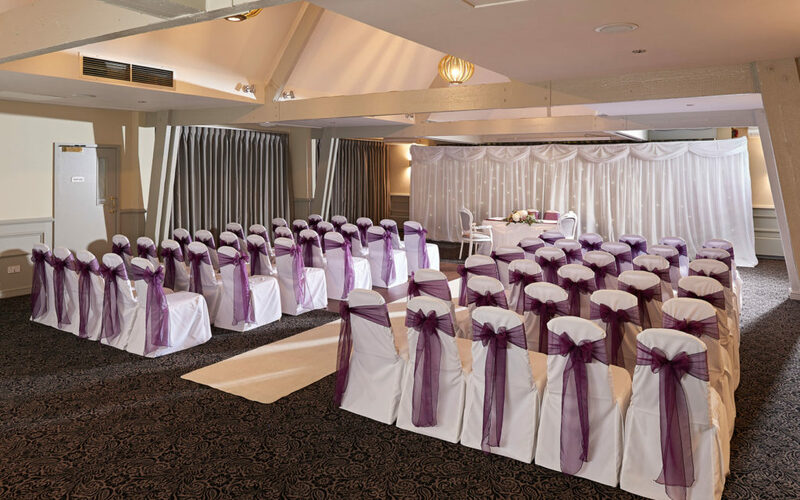 We are licenced to host both civil ceremonies and receptions for up to 150 guests. There is only ever one wedding on any date, it is always your day. Don’t forget when the day is done we have 53 bedrooms all with oh so comfortable Hypnos or Millbrook beds, preferential rates for your guests and a well stocked recovery breakfast buffet the next morning, a chance to catch up with everyone and compare notes with your friends & family. Download Our WEDDINGS BROCHURE and sample WEDDING MENUS. Want it all? You can have it! We offer exclusive use of the hotel function rooms and all of our 53 bedrooms. The hotel is literally yours from the beginning of your ceremony or reception until checkout the following morning. No need to book hotels for your guests, find taxis or most importantly end the party early. To top it all off everyone gets a lie in and a cooked breakfast! Our wedding co-ordinator Nina is the best person to help you. Give Nina a call on 02380 277 800 or get in touch here. Flooded with light and looking out onto our sunken garden (which is perfect for pictures by the way), the Garden Room is our showpiece. Private but not cut off from the rest of the hotel, you and your guests will be able to enjoy our blend of warm yet professional service as your day unfolds. Whatever your style this room can be dressed to compliment and enhance. It has a real sense of scale and provides the perfect space for up to 150 people. With its own wooded garden at the front and a picture window at each end the Coppice really does feel like it could be in a woodland glade. Once the fairy lights are up and twinkling your guests will be enchanted with this room. Great for ceremonies or receptions for up to 80 people and evenings for up to 120. 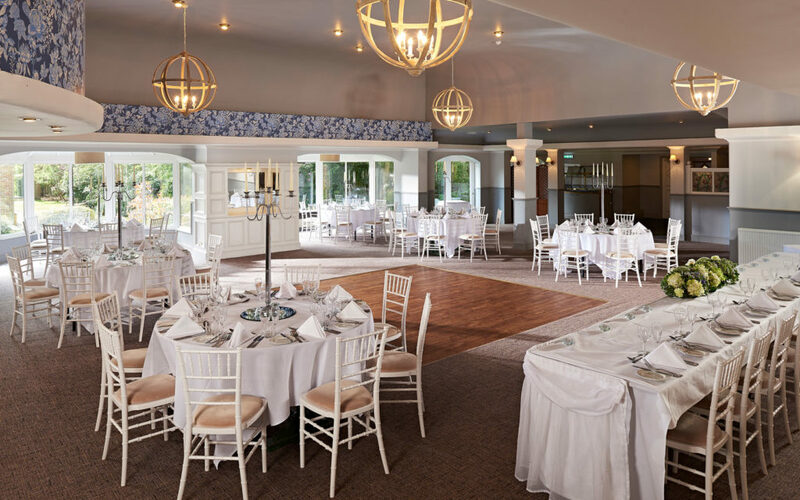 This bright room makes a wonderful ceremony space for up to 60 people and with a small staircase to descend your entrance will have a real sense of occasion. 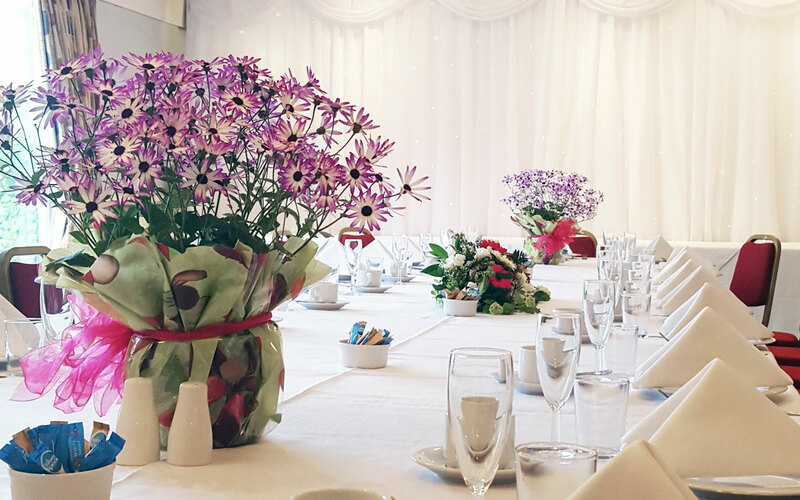 If you are planning an intimate reception, the Ampfield looks fantastic with a single oval table decorated in beautiful style and is the perfect place to gather your favourite people close by and celebrate together.